It is no surprise that my favorite nail polish from the Urban Decay Naked Nail Polish set is “Smog”. It so happens to be my everyday color from the Naked I eyeshadow Palette. I am sure I am not the only person who wishes Urban Decay made these polishes full size. Until they do, however, I will continue to search for a passable dupe. ALL PICTURES TAKEN WITHOUT TOP COAT. Smog has a dependable formula. It does not streak and it has a great consistency. I reach opacity with one coat but for a richer color I use two. 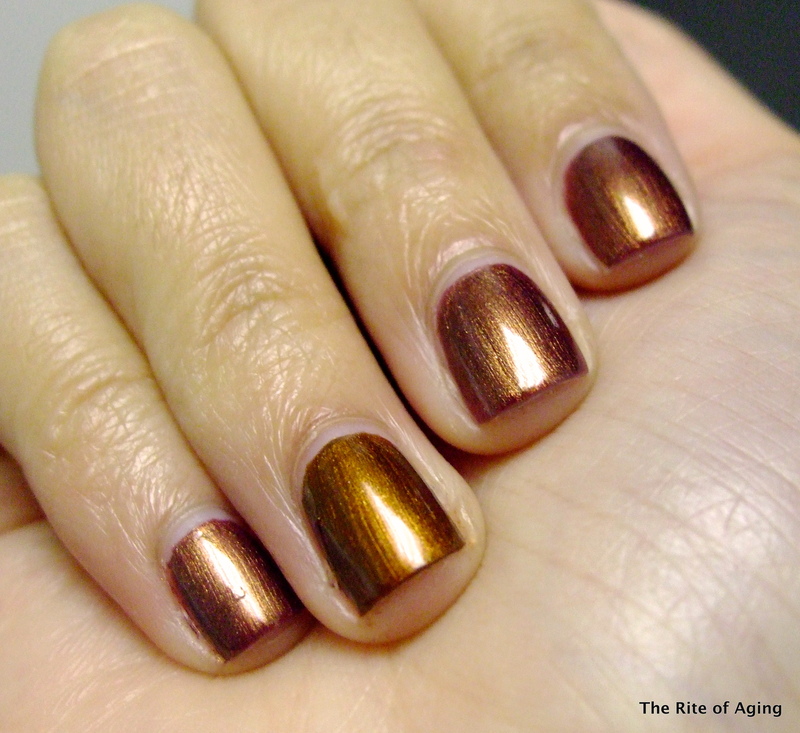 It is a heavenly brownish-red with gold shimmer. I may dare to say it has duo chromatic tendencies because in certain lights it appears purplish-brown. I love this color because it does not wash me out as most browns do. 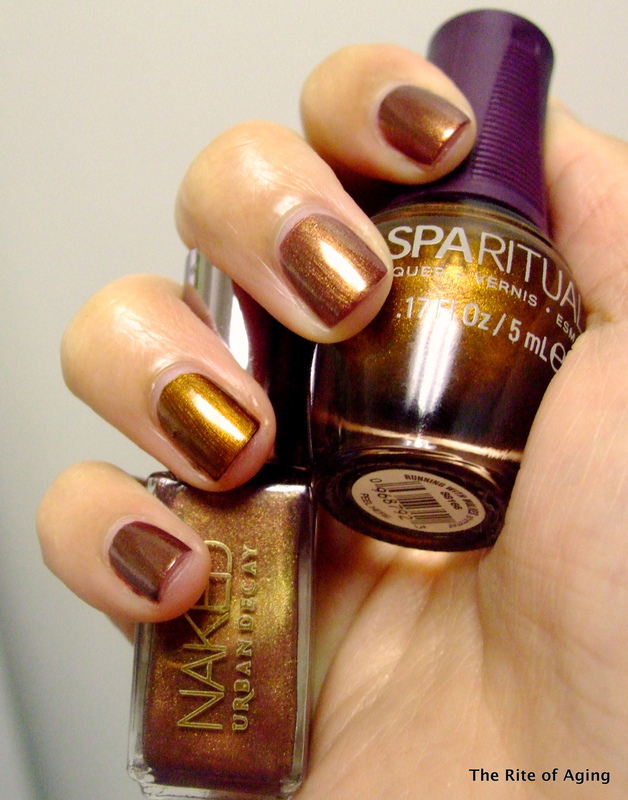 SpaRitual Running with Wolves is a bright copper with gold tones. I reach full opacity with one coat but for fuller color I use two. It has a fantastic formula. It is a little thick but easy to work with. It applies smoothly and does not streak. The finish is very shiny. In some lights, both polishes look almost the same. Running with Wolves is warmer and brighter than Smog. The shimmer is more noticeable in Smog than in Running with Wolves. 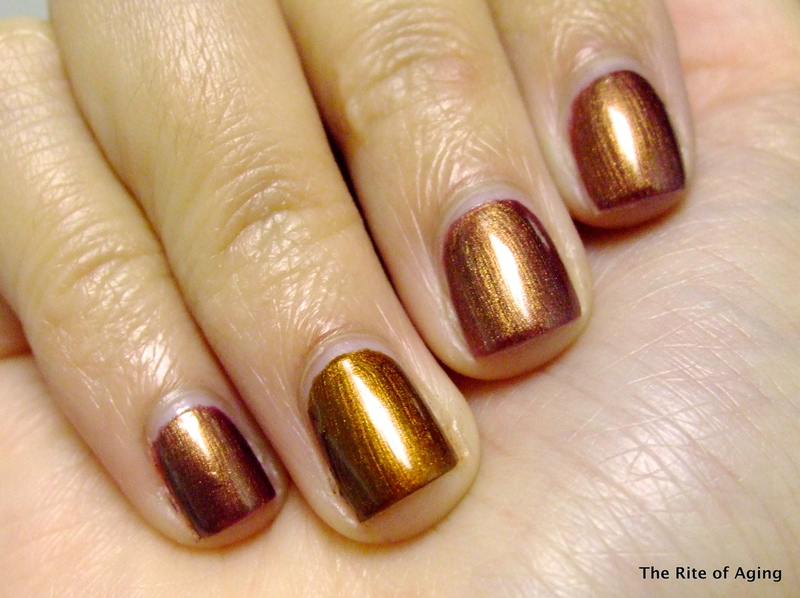 The finish on both polishes is shiny, however, Running with Wolves dries a little glossier. I really enjoy both colors. I like Smog just a little better. Running with Wolves is a great golden brown but I prefer the more muted tone. Brighter browns tend to make my skin look dull. Overall, I think the polishes are quite different. Regardless, Running with Wolves passes my dupe test for Smog. I wish the eyeshadow had a little more of the red-purple to it…but I have to agree this polish is definitely nice!